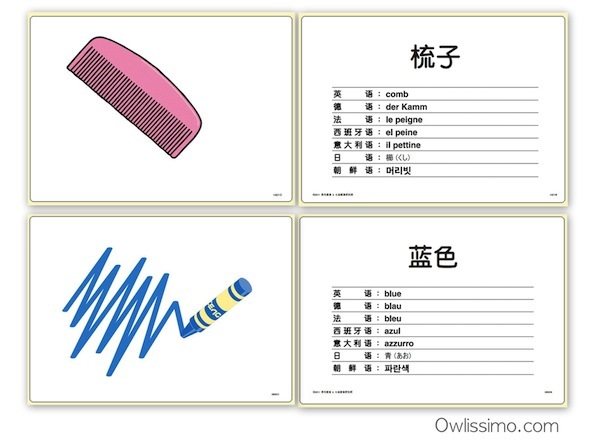 Q: Since there are several languages printed on the flash cards, how could we introduce at least the two main Asian languages to the kids in parallel? If the flashcards have both languages, I flash the same cards in English and Chinese on alternate days. Since I learnt a tiny bit of Italian years ago, I’ve started flashing in Italiano when I feel like it too. The kids are intrigued and love it! Q: What’s your schedule for for retiring the cards if I flash them in different languages? Actually, there’s no hard and fast rule. If I do 2 languages with the same pictures, I usually retire them after a week, unless I’m too busy to change cards. Many young children love new cards, especially pictures. Super-fast learners (especially those started really young) may need new cards after only 1-2 sessions. So using a second, third or even fourth language helps mummy to reuse the same cards over more days (or even weeks!) and the kid remains interested. The key is to keep her interested in flash cards and high-speed learning, through new / interesting / rotated cards / new language. Also, having a rigid program or schedule could raise tension for mummy and child, whereas right brain learning is most effective when both are relaxed. That’s why I always go with the flow. Just ensure that the learning sessions are fun. Q: Can we use 2 different languages when flashing cards? Will it confuse the child? As mentioned above, I flash cards in multiple languages. Within the day’s sets of flash cards, I include up to 3 languages – English, Chinese and Bahasa Malaysia. You may expose your child to as many languages as you know. Just use the same language within a single topic of cards and single sentence. For example, both Vee and Jae are able to count and do math in English and Chinese. This is because I flash math cards to them and explain math to them in both languages. To raise multi-linguistic children, simply speak as many languages and dialects as you know to them or around them. Think back about how you learnt to understand different languages and/or dialects when you were young. That was how my siblings and I picked up 2 languages and 3 dialects. All babies and young children have this ability. Exposure before age 3 is the key because young child are naturally good at picking up languages. And create the environment to use the languages. hubby and I speak Chinese and English to each other. That’s why they’re effectively bilingual in English and Chinese. For Bahasa Malaysia, we engage a home teacher to converse with and teach us. In one conversation, I may use multiple languages / dialects. However, in each sentence, I try to ensure that it’s in a single language. Then rephrase the sentence in Chinese. Then say the colour in Malay. When the multiple languages are part of the family’s lifestyle, the child will naturally enjoy using them. Have fun teaching your little one! Thanks much for the informative mail. Just wondering, would you recommend flashing foreign language (eg French, Italian) via DVD to a 13month old (my daughter) and 3year old (my son)? I am not an advocate of exposing kids to television and electronic gadgets such as hand phones, computers etc, but I recently learnt that learning foreign languages helps in improving their cognitive ability. I have hence started to show them DVDs of words and pictures (from Wink to learn) around 2-3min a day, not sure if that’s advisable? Hi Denise, I’ve also read that multi-linguism is helpful. How about starting off with all the languages and dialects that you and your family know? I find this effective in enhancing my kids’ cognitive ability and practical at the same time. We’re speaking with them Chinese, English, Malay (with help of tutor), Cantonese and Hokkien. I also flash cards to them in Italian because the phonics is rather easy to pick up. For language exposure, you may also try songs or audio books. Some audio books come with physical books for reference. I like that these can be played in the background when the child is playing. Generally, for DVD / TV, I’d use it from about 2+ to 3 years old onwards, very moderately. And i’m mindful about the distance from the screen for concern regarding myopia.